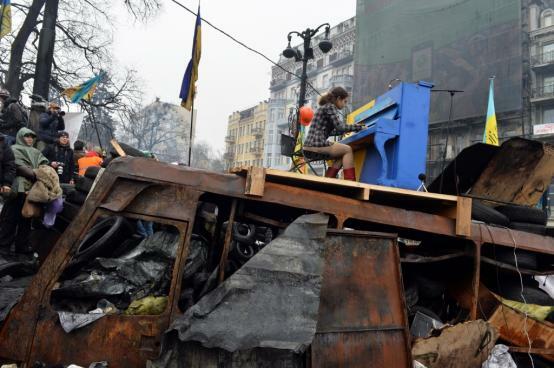 A piano rescued by a student of the conservatoire – which was meant to reinforce a barricade in the Ukrainian Euromaidan – became a participant in and symbol of the revolution. The instrument drew together the fates of the film’s protagonists, each of whom faced a different choice, in an attempt to occupy with dignity their due place in this dramatic conflict. Soon after, the piano also united the protestors in the Euromaiden. Ignoring the ice and snow, every day and night they sang the Ukrainian anthem and moving folk songs to its accompaniment. The instrument turned out to be more dangerous than Molotov cocktails... The authorities called the players “piano extremists”. Film and photography director. She was born in 1984 in Vilnius. A graduate of French Studies at Warsaw University. She also studied at the Photography Department of the Film School in Łodz and completed Developement Lab at the Andrzej Wajda Master School of Film . Currently graduate student at the Radio and Television Faculty of the University of Silesia. Her debut was the short documentary film Knife in the Wife.